MLK in a preparation meeting. Selma is a film about the 1965 marches from Selma to Montgomery, Alabama to pressure the Federal Government over the issue of voting rights for African-Americans in the South. The film has been the subject of recent controversies about its historical accuracy as well as itself being snubbed at recent awards ceremonies like the Academy Awards despite the overwhelmingly positive critical response the film has received. It is a deeply political film that focuses on the role that Martin Luther King Jr. played in organizing and leading those marches as well as the civil rights movement in general. It has been noted for not painting the picture of the “sanitized” MLK Jr. but rather the “radical” MLK who understood the need for civil disobedience and mass mobilization. A film of this nature is always subject to controversy. Many, including on the Right, have criticized the film for portraying President Johnson (or LBJ) in such a negative light. They argue that the film made LBJ seem opposed to the march that MLK was helping to promote when they claim he was actually very supportive. Liberals and conservatives who are upset by this portrayal are upset by the fact that MLK was not just working hand in hand with the Democratic Party but rather was an outside force putting pressure on the establishment. The film, according to this narrative, doesn’t do justice to the role that LBJ and the Democratic Party played. In reality, however, it was the other way around: the civil rights movement was itself the reason that the Democratic Party wanted to move forward in the legislative arena, and it moved forward reluctantly. It is this concept of how the movement made an impact on society that the film is based on. The director of the film Ava DuVernay responded to these various criticisms by saying that the “notion that Selma was LBJ’s idea is jaw dropping and offensive to SNCC, SCLC and black citizens who made it so.” The film depicts the hard work that went into making these kinds of marches possible. The early ground work of reaching out to community organizations, direct action training, and the “backroom” political dealings are all depicted as playing important contributing parts of the wider movement. And importantly, MLK is himself not presented as a sort of all knowing larger than life figure, but rather a major charismatic leader amongst many militants and activists who play just as important roles as he did. The tensions within the movement are also depicted in a realistic way that contrasts to the rosy picture we are often fed in these kinds of films. That rosy picture usually shows everyone united and working together well. While this movement was indeed united, it’s important to understand tensions between MLK and groups like SNCC because those tensions helped to shape the movement in important ways. Riot police get ready to charge the marchers. 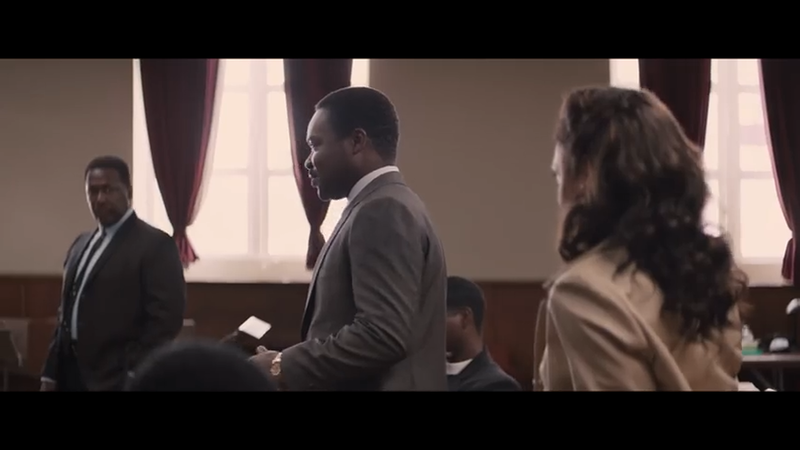 Something that really sets this film apart from many other narratives about the civil rights movement in popular culture is how it depicts the state’s efforts to discredit, spy, and destabilize MLK. To move the story along, instead of having generic captions of what was happening next in the years in question, the film showed internal FBI communications about the movement in general and in particular their surveillance against King. There are also scenes with the President and the director of the FBI (J Edgar Hoover) who discuss ways to spy on MLK and try to figure out how much of a “threat” he is to the US. While this history is well known, it usually isn’t highlighted the way it is in this film. The other controversy around the film is how much it has been snubbed at recent awards ceremonies. At the Golden Globes, the film did not win most of the categories it was nominated for despite glowing reviews by critics. But more importantly, it was not even nominated for Best Director or Actor at the Academy Awards despite being nominated for Best Song (which it did win) and Best Picture. While this highlights a bigger problem in the film industry, it is likely that the political nature of the film played a role in the snubbing. Selma is a well done film and deserves praise for that alone. But from a political perspective, it does what many other films this popular refuse to do and really tackles uncomfortable aspects of American history. It should be viewed by progressives today as parallels between the marches in the 1960s and the marches of the past few months are striking.